Here’s a special requirement: carrying coffins safely and securely! A reinforced floor: Most coffins are made from solid wood and are very heavy. Though they obviously vary in size, they are always bulky and can even exceed 2 metres in length and easily reach 80 cm in width. Maximum protection against dents and scratches for the walls and all other surfaces. Handling a large, bulky object with sharp corners inside the tight space of a van body obviously involves a high risk of impacts of the sort that can cause serious damage to a van’s bodywork. A clean and professional-looking interior. The customer’s business demands a high level of professionalism and the greatest respect for the feelings and circumstances of the bereaved. Easy loading and unloading. Given the size and weight of the average coffin, loading and unloading must be made as light and easy as possible. Guaranteed safe transport, with no risk of accidental movement. Even though the van’s interior might be adequately protected, road safety regulations demand that loads be properly secured to prevent them moving around when the van is travelling. Every interior surface in this van is covered by Syncro System liners to ensure complete protection against dents, scratches and humidity. The floor is fitted with two layers of protection: a plywood liner covers the original floor while a second liner, this time in aluminium tread plate, provides the walkable surface. This double liner gives a triple benefit: a particularly strong floor, greater safety for the user thanks to a non-slip surface, and an eye-catching clean look. 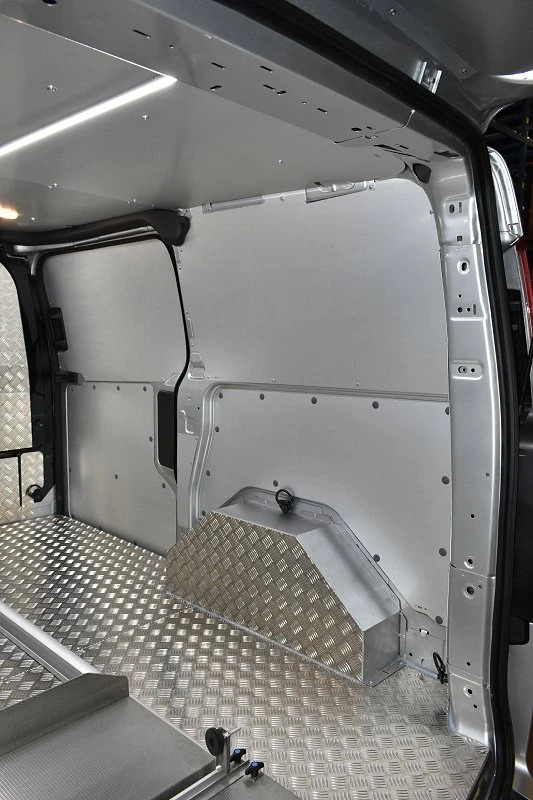 Aluminium tread plate also lines the van’s bulkhead and the inward facing surfaces of the wheel arches. The upper wheel arch coverings are in galvanised steel. Panelling in anodised aluminium was chosen to line the side walls, all the doors and the roof. The resulting space is particularly bright and easy to clean, conveys a sensation of asepticity and hygiene, and requires very little maintenance. 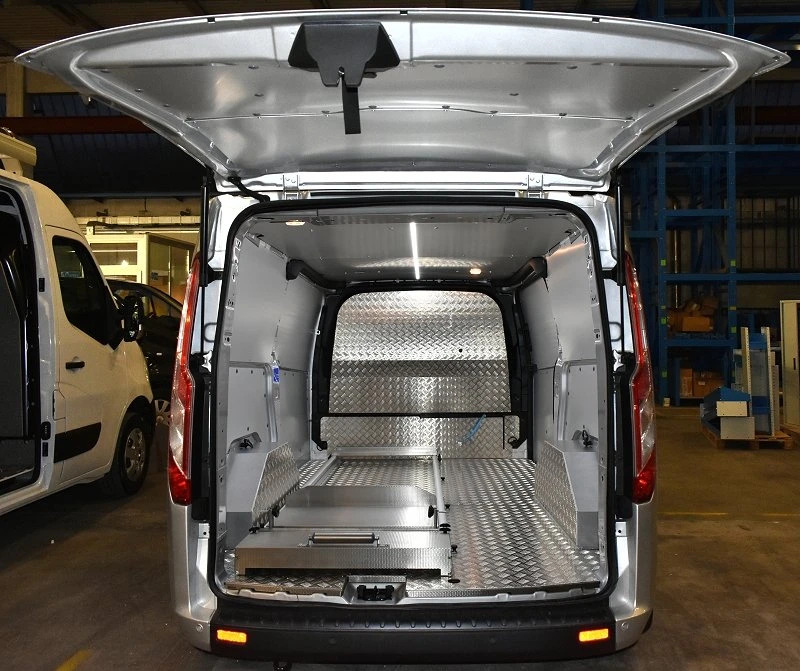 To facilitate loading and unloading, and to ensure the safe transport of coffins, Syncro System fitted this Ford Custom with a special coffin slide with aluminium rails. 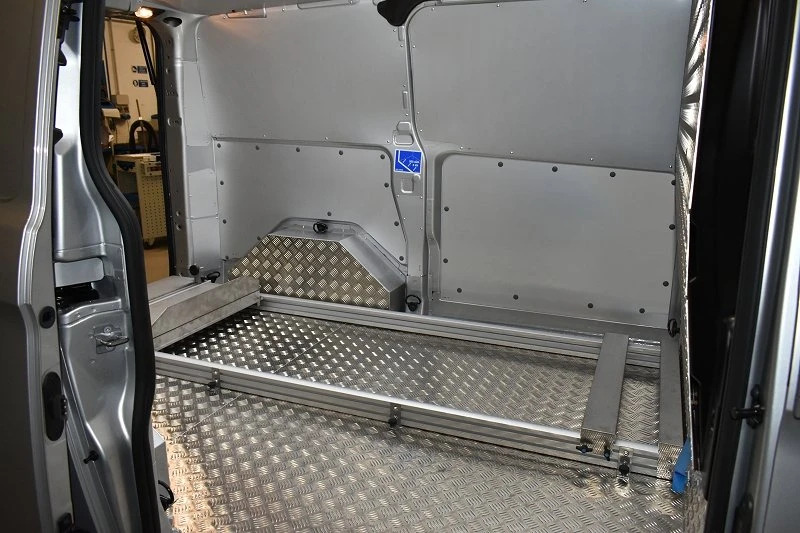 The slide is fitted lengthwise in the van’s load compartment and incorporates a loading roller at the rear. 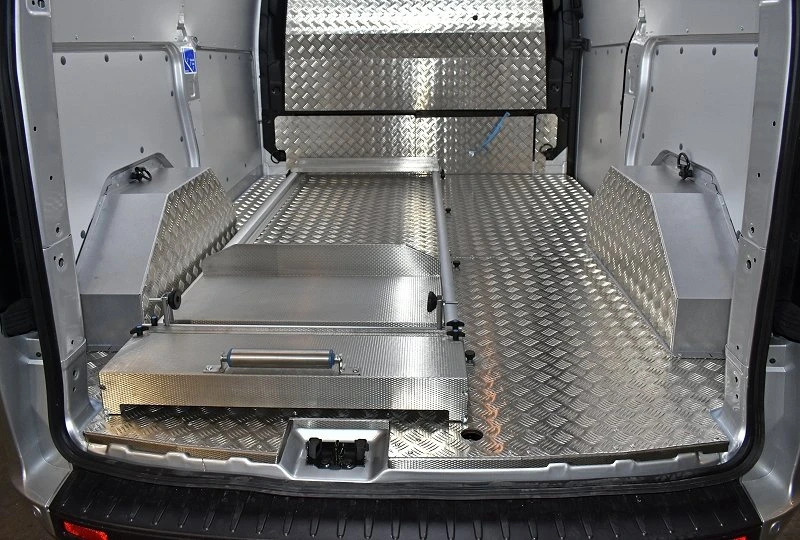 Every little detail is designed for the operator’s safety and convenience, from the raised plate that locks the feet of the coffin to the mechanical stop that prevents movement when the van is on the road. The slide can also hold the wooden carrier used to manoeuvre the coffin outside the van. Since you can never be too careful, in addition to a mechanical stop, Syncro System’s installation team also fitted the van with hooks and straps to keep the coffin 100% secure and virtually eliminate the risk of it sliding or moving during the journey.